Miniature Forelle pears are poached in spiced syrup made of candied ginger and various other spices. 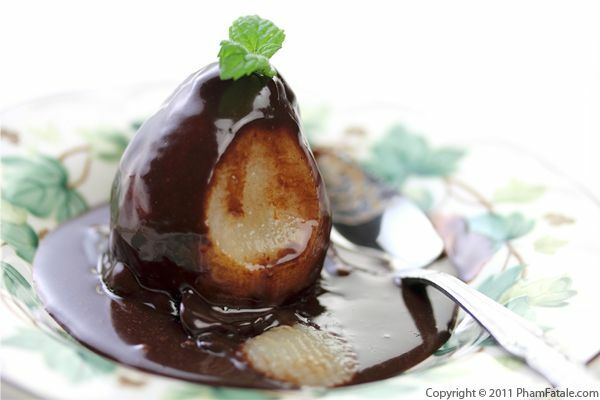 Once softened, the pears are covered with chocolate sauce. 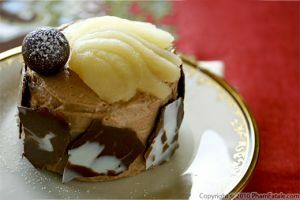 I prepared the pears a day in advance and the chocolate sauce was made at the very last minute. It took me probably 5 minutes tops. Everyone was pleased, the cook included! 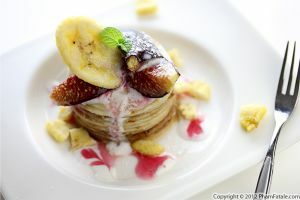 The small size of this dessert makes it a perfect finish to a heavy meal. For the ginger: Peel the ginger root with a paring knife or the edge of a spoon. Thinly slice it, then cut into long matchsticks. Peel and delicately core the pear, leaving the fruit whole. Drizzle with lemon juice to prevent oxidation. In a non-reactive saucepan, melt 1 tablespoon of butter. Add the whole pears with its juice. Toss well. Add 1-½ cups sugar and toss until the pears are nicely coated. Add the pear nectar, 1 cup water, lemon zest, cinnamon, nutmeg and ginger. Bring to a boil, then simmer for about 10 minutes. The pears should be very tender but still whole. Transfer the pears into individual serving plates, leaving as much liquid in the saucepan. Note: You can use the leftover (strained) syrup to enjoy as a drink by adding seltzer water and ice. In a small saucepan, combine ¼ cup sugar, ground cinnamon, light corn syrup, cream and 1 tablespoon butter. Stir, then bring to a near boil. Add the chocolate chips. Remove from the heat. Add vanilla extract. Stir well until the mixture is smooth and uniform. Let sit for 5-10 minutes. Drizzle the chocolate sauce over the pear until it's complete covered. Finish by covering the bottom of the plate. 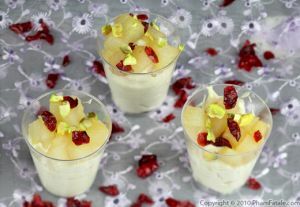 You could serve the pears with a large scoop of ice cream or simply garnish with a few fresh mint leaves. Serve warm with a grapefruit spoon (with serrated edges for easier grip). Depending on the season, the dessert can be adapted to other fruits such as peaches. It's equally delicious! 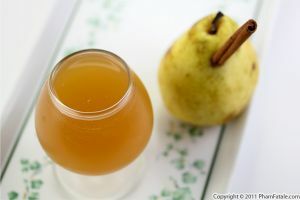 I used pear nectar but you can use any other juices or water for poaching the pears. You could also use larger-sized pears. Just make sure to cook with very ripe fruit. 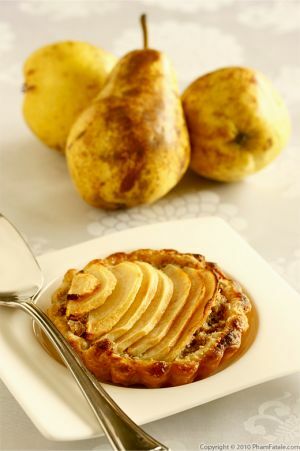 If you pair the pear dessert with vanilla ice cream and crystallized violets, you've created a poire belle Hélène. 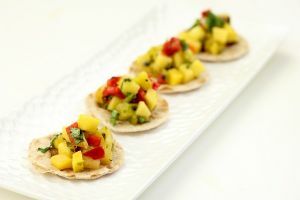 For crunch, you could garnish the dessert with lightly toasted sliced almonds or a wafer cookie. 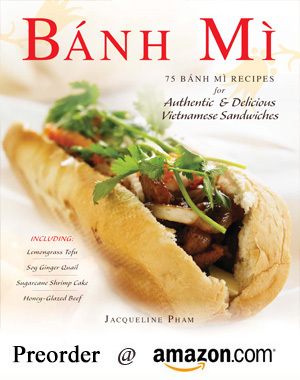 Published By: Jacqueline Pham on April 19, 2012.